This topic contains 10 replies, has 7 voices, and was last updated by Shelley 4 years, 5 months ago. According to History Link, the first bike arrived in (then) Washington Terr. 135 years ago today. On November 14, 1879, the first bicycle ever seen in Washington Territory arrives in Seattle aboard a steamer from San Francisco via Portland. Seattle merchant William H. Pumphrey displayed the boy’s size two-wheeler in front of his store at 617 Front Street (later 1st Avenue). On November 18, 1879, Jules Lipsky bought the bicycle for his son. very cool Shelley– thanks for sharing. I like the idea of the Seattle merchant putting a kid’s bike in front of his store to attract business. it reminds me of one of my favorite books, “Cold Sassy Tree” where a store owner in the deep south in the early 1900’s buys a car for the same reason. and I missed the Galloping Getrie anniversary? bummer!! I remember my next neighbor showed me and my friend that footage as a kid!! In less than 20 years they seem to have had the same problems, maybe more, as we have! Thanks VeganBiker. That was quite a fun read after an aggravating day of accounting. I’ve been looking for the one about the introduction of pedalers to our nation’s capitol. Tales of spooked horses, upset apple carts, and soiled ladies dresses, accompanied with a cyclist on a penny farthing with an evil grin. We got to see that GG footage in high school math class — definitely made for a memorable day, as I had never heard of a bridge collapsing on its own like that! I’m just gonna give the guy on the bridge the benefit of the doubt and say the dog was too spooked to get out of the car and that’s why he was left while the fellow crawled to safety. I’d rather not think about the alternative and I see no other reason to not let the dog out. Ah, bummer. I figured he must have been terrified, but if he was paralyzed, that would explain why the owner couldn’t’ve just left the door open for him in case he decided to make a break for it. 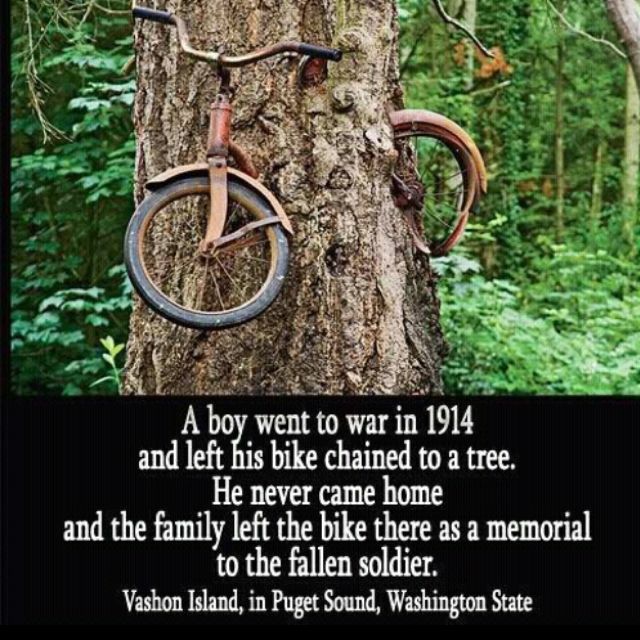 Given the way trees grow, that bike must have been stashed on top of a branch next to the trunk. The branch rotted away after the tree cambium engulfed the bike. Thanks Sunset Hill Guy for the post and Ernie for the rejoinder. The GG footage is pretty terrifying.